Hearing clearly enriches women’s lives. Leila Dean and Merle Godbold are sisters, and like most sisters, they’re close and have many traits in common. One characteristic the Washington, DC natives share, unfortunately, is a deteriorating hearing loss. By late 2018, Leila’s and Merle’s hearing losses had just about reached their nadir. “I could hardly hear what anyone was saying,” shares Leila, a retired Avon® representative. “It sounded like everyone was mumbling, and I had to have the television volume up so high that everyone complained about it being so loud. Merle was experiencing similar difficulties. However, since she was only having trouble hearing some things, she blamed it on the people speaking or the situation. She didn’t really believe she had a hearing loss. “I noticed I wasn’t hearing what certain people, not everybody, were saying, and I would have to say, What was that? or Say that again,” the former home health worker and mother of four reports. “My sister was the hardest person to understand because she’s so soft-spoken. Leila considered hearing aids a few years ago and asked her primary care physician for the name of an experienced and trustworthy hearing center. The physician gave her the business card of Kelly Hansen, AuD, at Trinity Hearing & Balance Center. 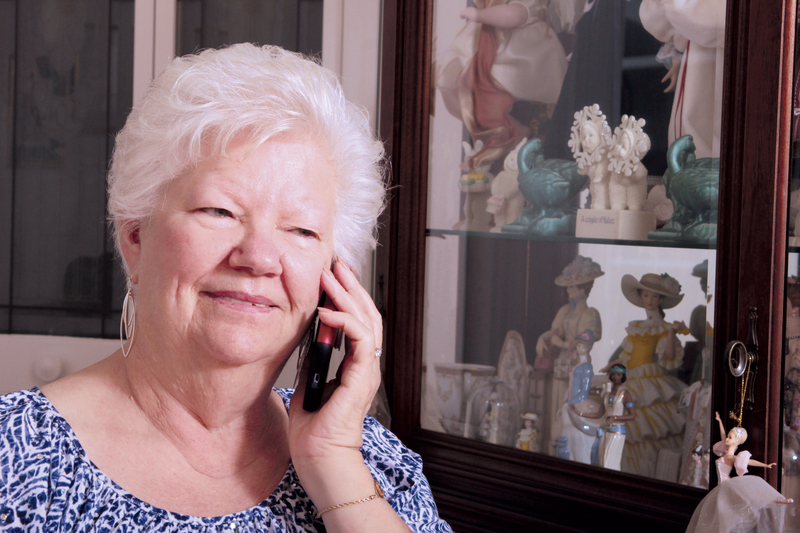 Leila didn’t move forward with hearing aids at that time, but she kept the business card. “I held onto that card and felt very comfortable knowing that whenever I decided to do something about my hearing, Trinity Hearing and Balance Center was where I was going to go,” relates Leila, who finally scheduled a hearing screening in November. Dr. Hansen and her colleague, Nikki Goldowski-Richa, AuD, worked as a team with Leila and Merle to guide them through the hearing aid selection process. The doctors counseled them on the best products for their specific hearing losses as well as their lifestyles and preferences. It wasn’t sister telepathy but past experience that made Merle also choose a rechargeable model of hearing aid. 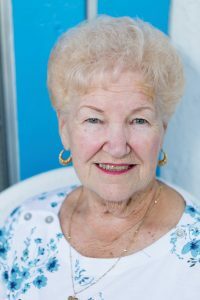 “When I did home health, I changed the batteries in my patients’ hearing aids, so I know how bothersome that can be,” Merle offers. “I told Dr. Hansen I wanted hearings aids that don’t need batteries because batteries don’t last long. It’s Trinity Hearing & Balance Center’s philosophy and dedication to patient care that set it apart from other hearing centers. “Trinity Hearing and Balance Center is proud to be an AudigyCertified™ practice,” declares Dr. Hansen. “We are one of only two hundred and fifty clinics in the nation to hold this certification. “AudigyCertified professionals are among the country’s most experienced hearing care professionals, its members possessing some of the industry’s highest credentials. Our expertise is measured by our commitment to patient satisfaction, continuing education and the expert application of current technologies. Once Leila and Merle got their hearing aids, a world of sound opened up to them. They can hear clearly now, and those situations in which it was difficult to hear are no longer problems for them. Both say they are more than satisfied with their choices. “With my hearing aids, I can hear everyone talking and understand what they’re saying,” Leila enthuses. “They don’t have to repeat themselves, and that for me is just wonderful. I have a fairly large family, and before when we were all together, it seemed like total chaos to me with everybody talking. “Now that I have hearing aids, I realize how much I wasn’t hearing before,” Merle admits. “Now, I can hear everything more clearly. And they’re very comfortable; I don’t even know they’re in my ears. Leila and Merle share their thoughts, and they both have a positive opinion of Trinity Hearing & Balance Center. Merle found the staff very professional and helpful. 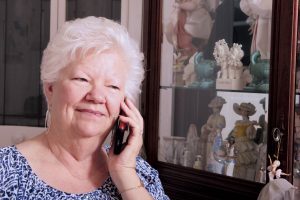 She says she’s so pleased that she keeps the center’s phone number handy in case someone she knows needs hearing aids, so she can recommend them.